I am always amazed by how we use things in the classroom that you wouldn't typically see in a classroom, or used in a way that you never thought of before. When I am on Pinterest, the things I see blow.me.away. I wish I had thought of even one of those good things! Man, I'd be a millionaire! This is my original idea! Take a binder clip, and a sticki clip and put it together. You now have a fantastic anchor chart holder that will last all year. 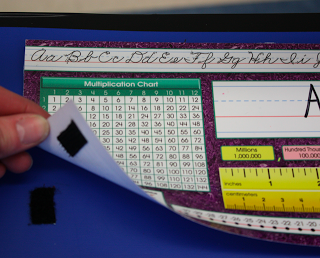 I hang my posters, anchor charts, and student work all over the room using these! I LOVE them! This whole board below was hung using my creation! We weren't allowed to have long lengths of paper so I did this! I have other things that I use that I have gotten from other places! Such as using the binder clips on my mailbox! I created chevron labels and put the kids numbers on them to put inside their mailboxes. I have spent hours in my room trying to scrape the old numbers off my mailboxes. This year I had cardboard ones and that was just a mess. So I bought a new mailbox system. See below - it is from Really Good Stuff. It was expensive, but I got a $50.00 off coupon. The whole thing is made of wood. 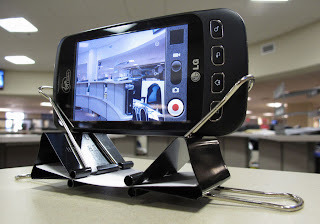 Cell phone stand with a binder clip - now I take pictures of my class with me in them without having to ask for help! This one was genius! Seriously! Ok the last binder clip one - this is used on the side of my desk. It holds my printer cord, cell phone cord, phone charger and ipod cord! Pure stinking genius. 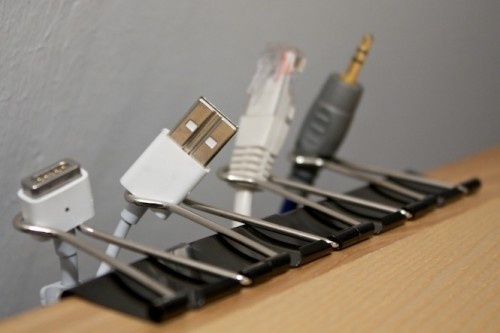 My cords used to get stuck in my desk drawers! not anymore! woop! This lady is pretty smart! I will be using this for a few of my kids this year. Much easier to search for that missing item if you can just pull out the drawer. Woot! The next up is the creator of the LOCK SMOCK! I am so thankful for this. Pre-Sandy Hook, we had to teach with our doors locked. They didn't need to be closed, but locked. Well, first graders and wind are always closing our doors, so thank goodness for The Price of Teaching!!! It is super cute and my door can shut and not be a problem! Whoot again. 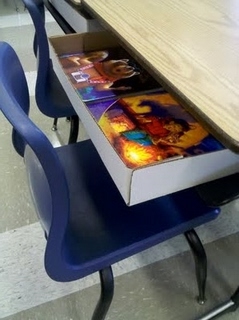 I used this idea when I had tables in kindergarten, but never thought of them using these name tags once they had desks, but in combination with the drawer, how easy would it be to swap desks?! I will be doing this this year! 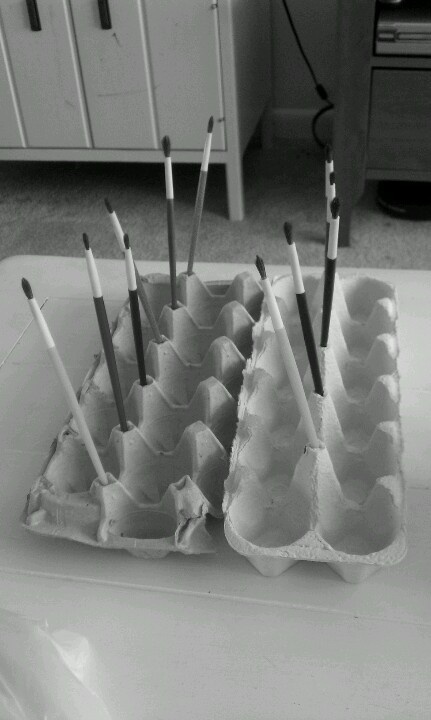 There was only a picture of this on pinterest, but I was thinking pretty smart. Now my husband can't get mad with me saving all of my junk! This is seriously so freaking smart. I am SO tired of hearing those water bottles crash to the ground and hearing my paper is wet, so and so dropped their water bottle. UGH. 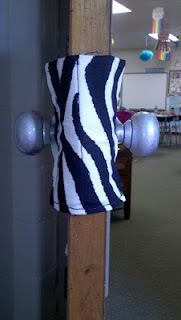 I bought a cute chevron over the door shoe holder and that is where they will go! Thank goodness! What have you used, created, found, hope to use, hope to make in your classroom that makes things easier? It can be an organization tool, piece of furniture or some other creative item? Obviously, it doesn't have to be your own personal creation, so post away! Be sure to link back to me and leave a sweet comment! I love binder clips...why have I never used them to hold my wires!! I will be linking up soon...I need to get in my room first though! I know, I picked a bad time for a linky! I am just not popular enough yet. Maybe if I can get to 200 plus followers I would be able to. Everyone is busy setting up and linking up with the big bloggers...A girl can dream...right? Never thought of using the shoe organizer for H2O bottles....I feel the same way about them!!!! !